Gill discusses economic development, the Tempe Chamber’s legislative agenda and her vision for the organization. As the CEO of the Tempe Chamber of Commerce, Anne Gill is taking the organization to the next level to reflect the vibrant community in which it operates. A skilled nonprofit leader, Gill is no stranger to leading a chamber of commerce. Prior to assuming her current role in October 2016, she had served as president and CEO of the Ahwatukee Foothills Chamber of Commerce since 2011. Gill took time out of her busy schedule to discuss the importance of economic development, the Tempe Chamber’s 2017 legislative agenda and her vision for the organization. With a keen focus on promoting and strengthening the community, it’s not a mystery why Gill is so passionate about leading the Tempe Chamber of Commerce. As a small business owner herself, Gill understands a lot of what other small business owners may be going through. Possessing a purposeful approach to delivering results and a demonstrated expertise in strategic planning serves Gill well. She provided some insight on what we can expect to see from the Tempe Chamber this year. “It’s an exciting time,” Gill said. “We just had a strategic planning retreat with our board of directors and the Tempe Chamber team to discuss a three-year plan to take the organization to the next level.” Having a vibrant chamber reflects the vibrant community in which it operates, Gill says. And building its membership is a key objective. “We have just under 600 members currently and we anticipate growing that over the next three years up to 1,000 members,” Gill said. Gill also provided insight into the Tempe Chamber’s robust advocacy efforts and what key areas the organization will be focusing on during the 2017 legislative session. “Advocacy is a big area of focus for the Tempe Chamber,” Gill said. As one of nine chambers in the East Valley Chambers of Commerce Alliance, the Tempe Chamber collaborates on a consensus policy agenda that is presented to the Legislature. This agenda serves as a way to represent more than 6,000 businesses in the East Valley, Gill says. “The Tempe Chamber has its own local city agenda, as well as a state agenda and federal agenda, that we work on to make sure we ensure and maintain a business-friendly environment,” she stated. Gill also stressed the importance of monitoring regulations to make sure that what’s in place can stimulate growth and not hamper the expansion of business. With a dynamic business landscape in Tempe, economic development is also a main focus area for Gill and her team. 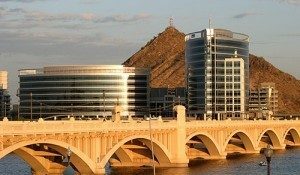 The Tempe Chamber engages proactively in the efforts of the Maricopa Forward economic development initiative to produce a vibrant and balanced regional economy. – Written by Jill A. Brownley, marketing and communications director, Greater Phoenix Chamber of Commerce.